Verde Butterfly is a Natural material. 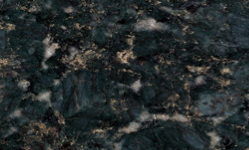 Verde Butterfly is a Medium priced Granite stone. Verde Butterfly is a fantastic looking material, mostly dark grey/black with blue and some light grey/white in it. This material can be found in both traditional and modern kitchen designs. For all cleaning instructions please see our Granite Worktops Care Sheet. Verde Butterfly is a Natural Granite from Brazil, Landford Stone offer this type of stone in a variety of thicknesses and finishes. Verde Butterfly is a Medium priced stone and will look incredible in your home!